From now until 30 April 2017, you will receive HK$25 cash reward if you complete your Customer Investment Profile questionnaire. You can renew the profile instantly via Online Banking. Act Now! * For best viewing experience, please use one of our supported browsers to complete the Questionnaire: Microsoft Internet Explorer V6 to V11, Safari V4W or Mozilla Firefox V3.5 to 3.6. The promotion period is from 15 February – 30 April 2017 (both dates inclusive) (the “Promotion Period"). 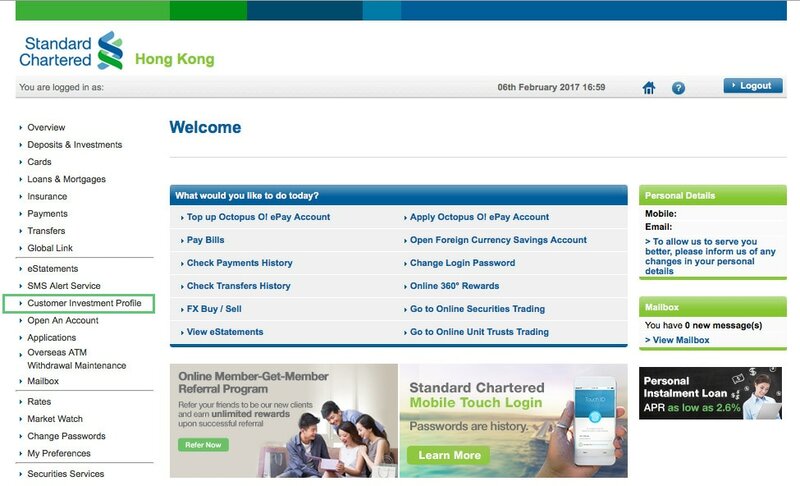 The HK$25 cash reward (the “Cash Reward”) is only applicable to the selected clients of Standard Chartered Bank (Hong Kong) Limited (the “Bank”) who have received an electronic mailer or SMS (“Selected Clients”). Each Selected Client who completes the Customer Investment Profile questionnaire via Online Banking or download the questionnaire, complete and return it by post to P.O. Box 68383 Kowloon East Post Office during the Promotion Period (the “Eligible Client”) can receive the Cash Reward. Each Eligible Client may only enjoy the Cash Reward once irrespective of the number of times he/she has completed the Customer Investment Profile questionnaire during the Promotion Period. The Cash Reward will be credited to the Eligible Client’s HKD/USD account either in sole name or joint name, in the following sequence: 1) Integrated Deposits Account, 2) Statement Savings, 3) Passbook Savings or 4) Current Account on or before 30 June 2017. If the Eligible Client has more than one account under the same account type, the Bank will select the one with the latest account opening date. Eligible Client’s banking account held with the Bank must remain valid at the time when the Cash Reward is credited to his/her bank account. Otherwise, the Cash Reward will be forfeited. The Bank reserves the right to terminate, extend or vary any of the offers and to vary or modify any of the terms and conditions from time to time without prior notice. In case of disputes, the decision of the Bank shall be final and binding. Investment involves risks. This webpage is for your reference only. It does not constitute any invitation or recommendation of any product. Having a "Customer Investment Profile" will be a prerequisite for investors and for us to assess suitability of all investment subscriptions/switch-in transactions#. Therefore, please remember to complete the questionnaire before investing to avoid any inconvenience. #excluding securities trading and the transactions conducted via Online Unit Trusts.